A wreck with a tractor trailer can be a serious matter and dealing with the repercussions of such a wreck can be complicated and frustrating. Oftentimes the injuries are catastrophic and the damage to your vehicle results in a total loss of the value. Legally, dealing with a tractor trailer accident is very similar to an auto accident but in many cases, an injured person will have to deal with a company that ships all over the country or in other instances, an independent contractor who has his own insurance. 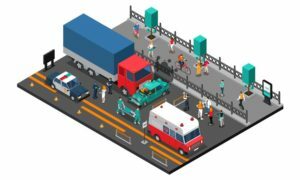 Added into the mix is a layer of federal regulations, which apply only to commercial vehicles and can add additional requirements to a commercial vehicle and possible increase the level of liability. These regulations control a commercial vehicle’s frequency of inspections, lighting, height, resting periods of the driver, weight, tires, brakes etc. and all of these requirements are found in the Federal Motor Carrier Safety Regulations which are promulgated by the U.S. Department of Transportation. Compliance to these regulations must be documented in the truck’s log. The instances of negligence, and the opportunities to establish liability, go up significantly if the truck has not complied with said safety regulations, however any safety violations have to be related to the wreck itself and the injuries in order to place fault on the commercial vehicle. If you are a victim of a tractor trailer accident, Slaughter Law recommends taking the following steps to help insure you get the justice you deserve. Call 911 Make sure law enforcement comes to the scene to collect insurance information and file a wreck report. Make sure you receive a copy of the report. Usually, you can collect the police report days to weeks after the incident. The law enforcement on the scene may or may not look over the truck and check its log books. On North Carolina’s record reports, there is a special section for commercial vehicles that require thorough documentation and inspection. Receive Medical Care If you are badly injured, go and receive medical care. If you suffer from minor injuries, still see a medical professional after the incident clears to document what you have suffered. If you have seemingly no injuries, Slaughter Law recommends you still see a medical professional to rule out any unknown injuries that could become a problem after the case is settled. Make sure to take pictures of all injuries and keep all medical bills and records. Take Pictures and Videos Take as many as possible from all angles. Sometimes memories fade or cars are moved and having these on hand will help end any possible disputes. If you are injured and cannot take pictures, Slaughter Law recommends you call a friend or family member to go to the scene and take the pictures and videos on your behalf. Do not count on law enforcement to take pictures, they tend to take pictures only if it is an extremely severe case or there was a death. If you are badly injured and taken away in an ambulance and no one can be on scene on your behalf, Slaughter Law recommends that once you have been released from medical care, go to your vehicle. There you can take all pictures and videos you were unable to before. Collect all personal belongings If your car is to be towed away, make sure to collect all personal belongings and necessary documents. If your car is totaled, make sure to also take your license plate and your license tag, you will have to turn those into the DMV. If you are unable to do so on the scene, go to your vehicle and collect your belongings after your release from the hospital. Notify Insurance When the accident has cleared and you have a moment, make sure to notify your insurance of the wreck. Hire a Lawyer If you have been injured in any way, from stitches to internal bleeding, or the other party’s insurance company denies liability for the wreck, Slaughter Law recommends that you seek legal counsel. Dealing with insurance companies is a long and frustrating process. Done alone, you risk not receiving your due justice. An accident can happen to anyone at anytime. Slaughter Law recommends that you are always prepared for the worst by having the best insurance within your budget. Slaughter Law recommends under your car insurance coverage, you always have the most uninsured and underinsured motorist coverage, the most liability insurance, and the most medical payment coverage that you can afford. To help you avoid deadly tractor trailer accidents, we recommend you watch this safety video, 10 Tips For Sharing The Road With Trucks. For a free consultation, contact Slaughter Law at 910-763-1109 or by Email.